You can count on the Marines. News that the Marine commemorative silver dollar sold out Sept. 15 proved that. Actually, we normally count on the Marines to defend the country. No matter what the odds, the history of the U.S. Marine Corps is without peer as no obstacle is too large. Of course, even the Marine Corps had never faced the prospect of selling 600,000 silver dollars. 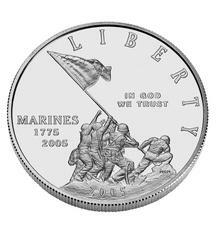 Experienced Marines were not fazed even though no silver dollar commemorative had posted sales that high since the World Cup Soccer dollar over a decade ago. In fact, silver dollar authorizations had even been dropped to 400,000 or 500,000 simply because there was no expectation that more dollars than that could be sold. A sellout might certainly surprise some, but not any current or former Marines. The achievement will almost certainly be taken in stride by the Marines; selling 600,000 silver dollars is to the Marines just a another goal to be reached in a 230-year history of always reaching their goals. Of course, the sellout of the Marine Corps 230th anniversary silver dollar presents us with a variety of issues. Frankly, there are no good historical models to follow, and that will make what happens in the near future all the more interesting. The fact that some did not expect such a sellout might well have been a result of optimistic thinking in the past. After all, there have been other commemoratives involving the U.S. military in the past but this is the first time where one seems to have truly reached its potential. There are still a few million World War II veterans and millions more people whose lives were marked by that conflict, but the World War II silver dollar sold just over 400,000 pieces.